No longer will you have to struggle with finding extra room as the Heavy Hauler AR-1 Layout Blind Bag quickly converts to a linear form that lies beside you and out of the way in a layout blind allowing much needed gear to be at the ready. Each compartment will hold 4 boxes of shotgun shells each or a combination of ammo and gear. A mesh zip open pocket under the lid allows more storage. No longer will you have to struggle with finding extra room as the Heavy Hauler AR-1 Layout Blind Bag quickly converts to a linear form that lies beside you and out of the way in a layout blind allowing much needed gear to be at the ready. Each compartment will hold 4 boxes of shotgun shells each or a combination of ammo and gear. A mesh zip open pocket under the lid allows more storage. The AR-1 allows for all the room one needs for gear while being versatile. If the hunt takes you to a pit, boat, or even timber the AR-1 blind bag will adapt like no other bag on the market. The shoulder carry strap quickly converts to a "tree belt" allowing the AR-1 to be wrapped around and strapped to a tree keeping ammo, calls, food and drink at the ready. 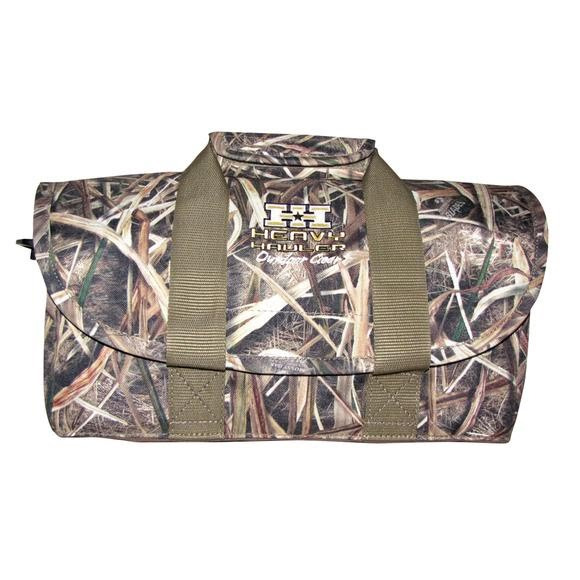 No longer does your bag need to be just a bag, but rather, gear that makes your hunt more efficient and enjoyable. Shoulder carry strap converts to a "tree belt"